Standardized Field Sobriety Tests - Tiftickjian Law Firm, P.C. 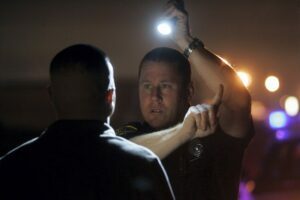 The Standardized Field Sobriety Test (SFST) is a battery of 3 tests performed during a traffic stop in order to determine if a driver is impaired by alcohol. The 3 tests that make up the SFST are the horizontal gaze nystagmus (HGN), the walk-and-turn, and the one-leg stand tests. Developed in the 1970s, these tests are often used to determine if an officer has probable cause to arrest and invoke Express Consent for driving while under the influence or impaired by alcohol. Horizontal gaze nystagmus is an involuntary jerking of the eyeball which occurs as the eyes gaze to the side. Under normal circumstances, nystagmus occurs when the eyes are rotated at high peripheral angles. However, when a person is impaired by alcohol, nystagmus is exaggerated and may occur at lesser angles. An alcohol impaired person will also often have difficulty smoothly tracking a moving object. In the HGN test, the officer observes the eyes of a suspect as the suspect follows a slowly moving object such as the tip of a pen or small flashlight, horizontally with their eyes. The police officer looks for three indicators of impairment in each eye: if the eye cannot follow a moving object smoothly, if jerking is distinct and sustained nystagmus when the eye is at maximum deviation, or if the angle of onset of jerking is prior to 45 degrees of center. HGN may also indicate consumption of seizure medications, phencyclidine, a variety of inhalants, barbiturates, and other depressants. Nystagmus can also be present due to medical conditions, head injuries or a result of a neurological problem. During the walk and turn test, the subject is directed to take nine steps, touching heel-to-toe, along a straight line. After taking the steps, the suspect must turn on one foot is a series of small steps and return in the same manner in the opposite direction. The officer looks for eight indicators of impairment: if the suspect cannot keep balance while listening to the instructions, begins before the instructions are finished, stops while walking to regain balance, does not touch heel-to-toe, uses arms to balance, steps off the line, takes an incorrect number of steps, or makes an improper turn. Age, injury or disease could affect the ability of a person to perform the the walk and turn test. During the one-leg stand test, the subject is instructed to stand with one foot approximately six inches off the ground and count aloud by ones beginning with one thousand (one thousand-one, one thousand-two, etc.) until told to put the foot down. The officer times the subject for 30 seconds. The officer looks for four indicators of impairment including: swaying while balancing, using arms to balance, hopping to maintain balance, and putting the foot down. Age, injury or disease could affect the ability of a person to perform the the one-leg stand test. The current approved curriculum involves a three-day training program. During this training, participants are taught to administer and interpret the results of the SFST battery, including horizontal gaze nystagmus (HGN), walk-and-turn and the one-leg-stand. Upon completion of the classroom training, the student must pass a comprehensive written examination and successfully complete a proficiency examination witnessed by an SFST instructor. For more information on the rules and training requirements for officers to obtain and maintain an SFST certification, click here. If you have been pulled over and subjected to roadside sobriety tests like the walk and turn test, the one-leg stand or the horizontal gaze nystagmus test you likely find yourself facing a DUI or DWAI charge as a result of these tests. Make no mistake about it, these tests along with your driving behavior, the officer’s physical observations of you, and the results of a chemical test will all be used against you in court and at the DMV. If you are being charged with a DUI in Colorado, you need the best legal representation that you can get. The DUI attorneys at Tiftickjian Law Firm have a reputation of being the best at what we do and many of our former clients feel the same way. To schedule a DUI consultation with one of our attorneys, call our office today at 303-384-5280 or submit an online consultation request through this website.